Republican (Term Expires: 2020) serving Lancaster (part) County. Scott Martin is a lifelong resident of Lancaster County with deep roots in the community. The oldest of seven children, his father was a career law enforcement officer and his mother a catholic schoolteacher. Together, Scott’s parents instilled in him and his siblings the core values he has carried with him his entire life. Scott attended Lancaster Catholic High School where he not only was an all-star on the football field, but also earned All-American status as a PIAA State Heavyweight Wrestling Champion and National High School Heavyweight Wrestling Champion. He then continued his academics and athletics at Millersville University. He went on to not only graduate with a degree in Sociology/Criminal Justice, but also became a three-time 1st Team PSAC Defensive Tackle and two-time All-American, including earning Kodak 1st Team All-American honors. After his college career, Scott was a free agent camp invitee of the New York Giants in the NFL and had three different stints in the Arena Football League. Before entering public service, Scott was successful in the private sector as a licensed Realtor and local landlord. In addition, for thirteen years, he worked to keep our communities safe and help turn the lives around of Lancaster County’s dependent and delinquent youth becoming the Director of the Lancaster County Youth Intervention Center. Running the county’s juvenile detention and emergency shelter-care facilities, he oversaw the effective operation of a $5.5 million budget and 150 employee organization. Scott was also the elected Vice President of the Juvenile Detention Centers Association of Pennsylvania and served on the Pennsylvania Commission on Crime & Delinquency’s Detention Steering Committee. In 2007, Scott Martin was elected by the people of Lancaster County as County Commissioner to clean up what had become a dysfunctional and ineffective government. Serving two terms from 2008-2016, that’s just what he did. While overseeing a $250 million budget and nearly 2,000 employees, Scott put fiscally conservative principles into action and achieved real results, even with the challenges of the Great Recession. As Commissioner, Scott never voted for a tax increase, downsized government by cutting duplicative agencies and departments, reduced debt by $40 million, and reduced costs for taxpayers through privatization and public employee benefit reform. Many of Scott’s initiatives and reforms were recognized statewide and nationally. Besides Chairing the Board of County Commissioners, he led many other boards, including the Prison Board, Elections Board and Transportation Coordinating Committee. He also made his mark advocating for reforms statewide through his leadership with the County Commissioners Association of Pennsylvania (CCAP). Through his eight years, he served on the Board of Directors of CCAP, was Chair of the Criminal Justice System Best Practices Committee and was elected by his peers for eight years as Chairman of the Pennsylvania Republican County Commissioners Caucus. Scott also served on the State’s Local Government Advisory Commission, the National Association of Counties (NACo) and testified on numerous topics before the United States Congress and Pennsylvania Legislature. In 2014, he was honored to be selected for and graduate from NACo’s County Leadership Institute in Washington DC. Long active in the local community, Scott served on the Board of Directors of the Dr. Gene A. Carpenter Football Foundation, volunteers as a youth sports coach in wrestling and baseball, and gave his time and effort to groups like the United Way of Lancaster County and the Pennsylvania Dutch Convention & Visitors Bureau. Scott has been recognized for his community service by numerous organizations and has been awarded the JDCAP President’s Award, the YWCA Lancaster Ally Award, the County of Lancaster’s Spirit of Good Government Award and the County Commissioners Association of Pennsylvania President’s Award, among others. Scott has also been inducted into the Lancaster Catholic Athletic Hall of Honor, Lancaster-Lebanon League Hall of Fame, PIAA District 3 Wrestling Hall of Fame, Millersville University Athletic Hall of Fame and the Pennsylvania Sports Hall of Fame-Susquehanna Valley Chapter. 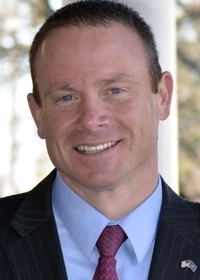 Scott enjoys Philadelphia sports, going "Down the Shore", fishing, wrestling and fitness. Scott and his wife Amber are the proud parents of four children, Alexia, Hayden, Alivia and Gavin.